Home Uncategorized Carissa Moore Wins Beachwaver Maui Pro with Perfect 10! Carissa Moore of Hawaii won the Final of the Beachwaver Maui Pro, Honolua Bay, 2018. HONOLUA BAY, Maui, Hawaii/USA (Tuesday, November 27, 2018) – The conditions at this year’s Beachwaver Maui Pro, the final stop on the 2018 World Surf League (WSL) Women’s Championship Tour (CT), were all-time and 3X WSL Champion Carissa Moore (HAW) took full advantage, winning over Malia Manuel (HAW) in the Final heat of the season with a Perfect 10-point ride.Moore clinched her 20th CT victory today, her third at Honolua Bay, and rounds out the season at No. 3 on the Jeep Leaderboard. 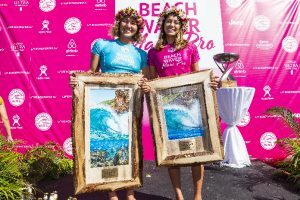 3X World Champion Carissa Moore (HAW – left) is the WINNER 2018 Beachwaver Maui Pro with Malia Manuel (HAW) runner-up at Honolua Bay, Maui, Hawaii, USA. Malia Manuel (HAW) advances to the Semifinals of the 2018 Beachwaver Maui Pro after winning Quarterfinal Heat 1 at Honolua Bay, Maui, Hawaii, USA. Previous articleA Band Of Braddahs… With paddles in hand, We Can.